With the nights drawing in and Halloween quickly approaching, at Brown’s Natural Pet Store we think it’s about time we talk about pumpkins! Aside from making seasonal and spooky jack -o’- lanterns, the humble pumpkin has many other uses and benefits, especially for our canine friends! 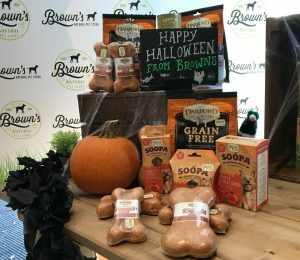 Both our stores in Goring and Ferring have a range of pumpkin based treats for your dogs as featured in the photo above, including grain free Pumpkin biscuits from Darford and a wonderful range of chews and toppers from Soopa. The actual pumpkin flesh is best fed freshly steamed or boiled. As a general rule, fruits and veggies are much easier for your dog to absorb and digest when blitzed to a rough broth with a little water. 100% canned pumpkin is also fine (check the World Foods aisle or your local health food store) but watch out for any added spices or sugars. As pumpkin is low in calories but high in soluble fibre, it’s ideal for regulating the digestive system, especially if your dog has the odd dodgy tummy or has trouble going to the toilet. It’s also high in vitamins and minerals for healthy muscles, skin and coat, and maintaining good vision. The beautiful rich orange colour of pumpkins comes from its Beta-Carotene content, known for its anti-cancer properties. Not sure how to feed it to your dog, or do you have a fussy canine that won’t touch veggies? Mix blended pumpkin with a little live yoghurt and smear it on to a Licki Mat or treat maze, or mix with high quality wet food and stuff it in to a Kong. If you’re feeling adventurous you could even bake some Halloween biscuits with this colourful superfood! We can’t wait to see what you come up with… share your pictures, videos, and recipes with us on Facebook or Instagram!